Pregnant women usually find they can't sleep as they they progress through their pregnancy. There's the visits to the bathroom during the night. There's the hip pain and strain on the back, and the sheer difficulty getting comfortable in the bed due to the size and shape of the baby bump. And these get more acute the later you are in your pregnancy. There's not much you can do about the bathroom visits (other than try not to drink water late at night). But you can do something about the hip and back pain and get more comfortable in the bed using a maternity pillow (also known as the body pillow). 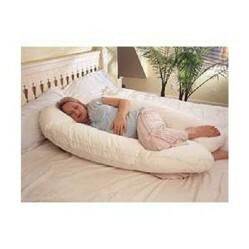 Body pillows are giant pillows designed to support the pregnant woman's shape. They usually come in a big "C" shape as in the picture. But you do find giant square shapes too. The "C" shape is the most popular because it relieves pressure on the hips. You usually sleep with it with the long bit around your back and the bottom part of the "C" in-between your legs. This opens the pelvis and relieves pressure on the hips. The long bit around the back supports your spine (the pressure of the baby bump usually pushes you backwards towards the pillow). Some women prefer to sleep with the long bit around the baby bump and the end again tucked in-between the legs. The thing to do is to experiment to see which suits you best. Most mothers will have already tried to build a makeshift version of the body pillow by stacking standard pillows around them as they sleep. But the trouble with standard pillows is that they move around during the night, frequently ending up on the floor. Body pillows for pregnant women however will remain in place as you will have tucked it in between your legs. You can also get U shaped pillows (sometimes known as back and belly pillows) - these are more expensive, but tend to be softer and more luxurious. Pregnancy body pillows can also be used after the birth to support you and your baby while nursing (i.e. they double up as nursing pillows or breastfeeding pillows). They can also be used later in life as support if you develop back problems. I remember how uncomfortable it was to sleep during my pregnancies. These would also be good for people with back problems. Have fun during the Christmas season with these affordable and fun Christmas maternity t-shirts.